Shelbyville, KY – March 22, 2019 – Razerhorse is pleased to announce an agreement with the Royal Kerckhaert Horseshoe Factory to provide exclusive distribution of all Razerhorse products worldwide. 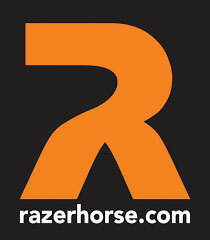 “As our product line has grown in popularity, we recognize the need to have a distribution system that allows for growth and reliability in the markets we serve,” stated Erik Lundquist, founder and president of Razerhorse. The Razer shoe technology was created in Sweden in 2003 by founder Erik Lundquist. After battling lameness issues with his own horses he began searching for an alternative to the steel horseshoe, which locks the hoof in place. With the aid of gait analysis software and high-speed video, the Razer shoe was developed using a tempered tool steel that flexed with the horse’s hoof. The Royal Kerckhaert Horseshoe Factory is the world’s largest independent horseshoe manufacturer with a global distribution network and specialized dealers in 74 countries. Kerckhaert is a market leader in their field and dedicated to excellence and innovation in the farrier industry. In 2008 Kerckhaert received the Dutch Predicate ‘Royal’ as proof of appreciation, recognition and commitment of more than 100 years. The Royal Kerckhaert Horseshoe Factory has been family owned since 1906. More information about Kerckhaert can be found at www.kerckhaert.com. Farrier Product Distribution (FPD) was founded in 1990 and is a wholesale distributor of farrier and related equine products and the North American Distributor of Kerckhaert Horseshoes, Liberty Nails and Diamond brands. Considered a leader in bringing groundbreaking products and service to the Farrier industry, the company distributes to suppliers throughout North America. 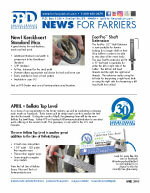 More information about FPD can be found at www.farrierproducts.com and facebook.com/farrierproductdistribution.